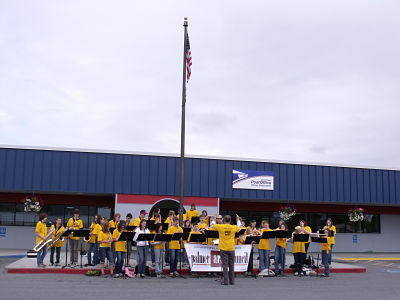 This morning I drove into the Palmer Post Office parking lot and was pleased to discover a live concert by the Palmer Summer Youth Band. The band is sponsored by the Palmer Arts Council and meets for weekly rehearsals throughout the summer. Middle and high school youth from Valley schools are under the direction of Matt Swalling, the music director at Palmer Junior Middle School. The students played exceptionally well and I thoroughly enjoyed the music. I was told they are playing the next two Fridays at the downtown Friday Fling. Come out and listen!